This is a very flamey 83. But it looks funny. This is the "stubby" version that I really think is ugly. They seem to be most common in 83 and 84 and mostly on designated "Custom Shop" versions. Most 81-85s have very accurate looking bodies. Look for those. What’s good and cheap these days for a 335? You can find them for under $2000 pretty routinely but a lot of them will be from the Norlin Era (beer, cement) and that can be hit and miss. When the suits took over Gibson, building quality guitars was no longer job one. Or job two. making more guitars for less money was job one and cutting corners was job two. Job three might have been convincing people that Gibson still made quality instruments. History has spoken to that. 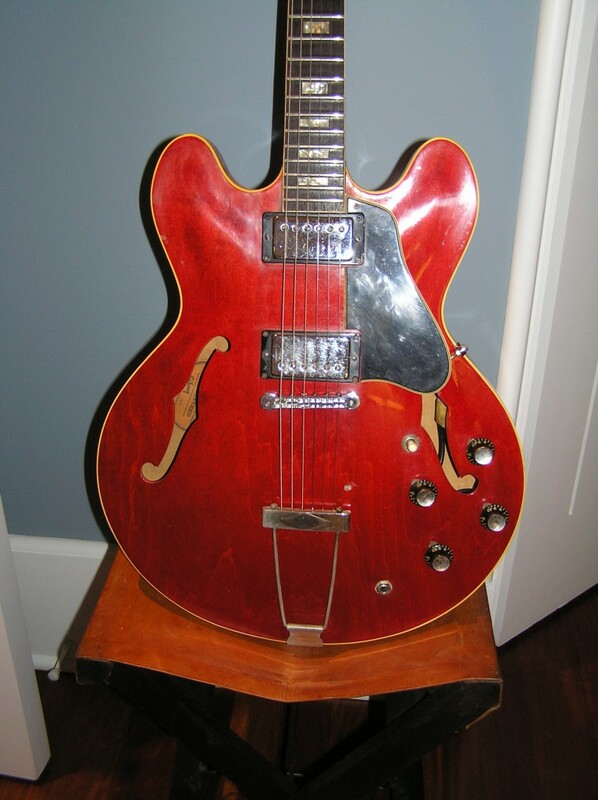 Most of you who read me regularly know that I don’t like ES-335s that were built between 1969 and 1981. There are good ones from the era but it’s a crapshoot at best. My rule when it comes to 70’s guitars is this: If you can’t play it first or there isn’t a liberal return policy, don’t buy it. Many ES models from the 70s suffer from poor builds, cut corners, heavy woods and poor fit and finish. Despite all that, there are still some good ones out there. There are a number of models unique to the era that don’t get a lot of press and I’ve written about many of them-the ES-347, the ES-325, 320, 340, Artist, Pro and ES-369. There are good ones and there are bad ones (and there are really, really awful ones). Like I said, play before you buy. That brings me back, again, to the bright spot among the Norlin guitars. Good and cheap (and vintage). It’s hard to believe that the ES-335 dot reissue came out 31 years ago. 1981 seems like a few years ago to me. Think about this. 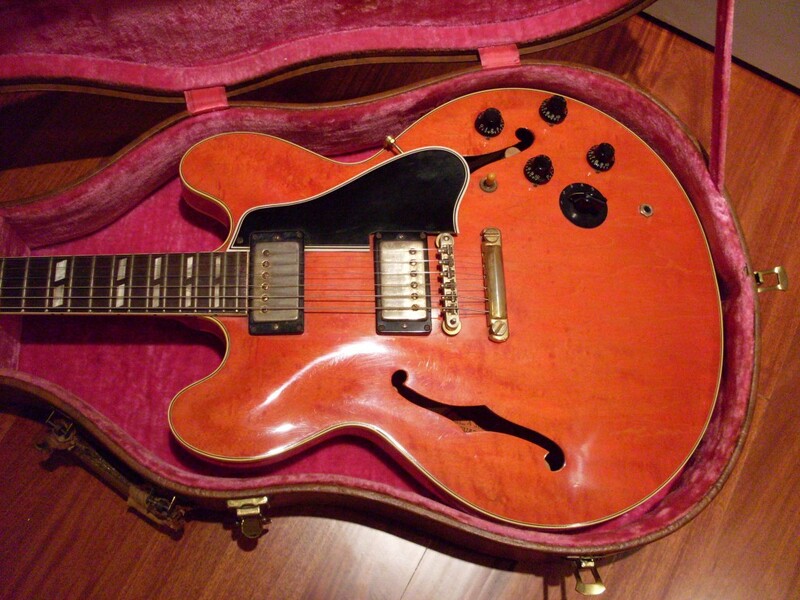 Had you bought a 59 dot neck in 1990, it would have been the same age as a first year ES-335 dot reissue. I’m not saying that the 81 is going to rival the venerable 59 in another 20 years but considering they run about one tenth the price of a 59 (and less than a Historic), they really are a pretty good deal. The other thing about the last of the Norlin 335’s is that they aren’t all created equal. The first year dot neck reissue has one unique characteristic-it uses a Schaller bridge which looks kind of clunky but is a pretty good bridge with a lot of mass and good tone and sustain. Late 81’s and all subsequent dot reissues made during the Norlin Era (until 1986) have the Nashville bridge-also a perfectly good bridge but, again, a bit clunky looking if you’re used to seeing an ABR-1. All of the 81-85s have Shaw PAFs (except for a few that came with EMGs). These are very good sounding pickups with a real vintage vibe. The guitars also came with 300K pots which have what most feel is a detrimental effect on tone. I’m not sure why but I’ve changed out the harness on more than a few 81-85 335s and heard a marked difference. The guitar brightens up considerably. The neck tenon is smaller than it was during the “Golden Era” but the guitars have no problems with stability. Necks can be three piece or one piece. Again, no problems with stability from either. I’ve been told the tops on some of these are birch-not maple. These two woods can be really hard to tell apart but birch is not usually figured and a lot of mid 80’s 335s are heavily flamed. So, if any of them are birch, they would be the plain ones. Plywood is not a tone wood, so I don’t think the makeup of the plywood is much of an issue. Lastly, there were two distinct body shapes. One is very close to the original dot neck and the other isn’t. The one that isn’t is a narrower through the waist and has stubby little horns. Ugly, ugly iteration. Avoid it if you care (they play fine). The other last thing is that if you want to get one cheap and, by cheap, I mean under $2K, look for a red one or a sunburst. The blondes (and first years) command a premium and usually cost around $3000-$4000. I think the 80’s sunburst is pretty awful looking but that’s just a matter of taste. The red is much more of a Ferrari red which can look pretty good. There are also black ones (nice!) and a special edition pearlescent white one (really ugly, if you ask me). I see sunbursts and reds routinely for $1600-$1900. Really good 335. Cheap. 1981 (first year) ES-335 dot reissue. Note the oddball bridge. It's big and heavy but it works pretty well. Gone by 82. Can't see the difference in body shape? How about now? The one on the right is an 85 with a few mods-an ABR-1 and a big guard. Andreja Marovic of Belgrade, Serbia. Goodbye, friend. look amazing mix of features…64 335 input- output jack + cans…is this a correct case? who is the manufacturer?? ?…did u buy this one? Andreja was an aficionado. He owned a beautiful 64 335 and quite a lot of other guitars. He was an enthusiast’s enthusiast. Andreja made me a better blogger by asking questions that sometimes didn’t even occur to me. I met him “in person” through Skype not long ago and we spent an hour or so talking about the great guitars we had, or we missed or we sold. I kept going upstairs and bringing guitars down to the computer so he could see them. And, in this way, he invited me into his home and I invited him into mine. It’s all very 21st century and it’s all good. When my interest in vintage guitars began, the only way to connect with like minded folks was to go to a guitar show. Now, there are dozens, if not hundreds of guitar related communities all over the internet. This is as close to World Peace as we get, I think. When folks of very different cultures share a common passion, the result is, usually, respect and friendship. My friend and guitar buddy Andreja Marovic of Belgrade died suddenly on Saturday April 14th. I don’t know the details of his death but I know that he never mentioned any health problems and he was always upbeat and energetic. We’d go 10 or 15 emails into a subject in the course of 20 minutes. My sincere condolences go halfway around the world to his wife and daughter . I sent them an email but I don’t know if they got it since the only email I have was Andreja’s. There are pages of wonderful tributes on the Les Paul Forum for Andreja. He was a regular contributor and was a friend to many there. I will miss him as will the rest of the vintage guitar community. His great passion and enthusiasm touched so many of us and he will not be forgotten. Збогом, мој добар пријатељ. zbogom moj dobar prijatelj. Goodbye my good friend. 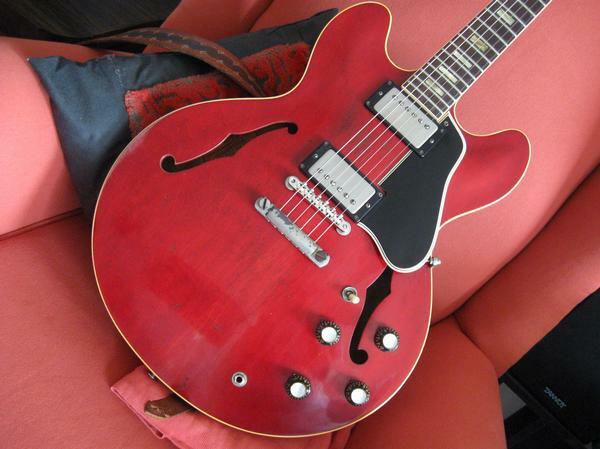 One of Andreja's favorites: His 64 ES-335. 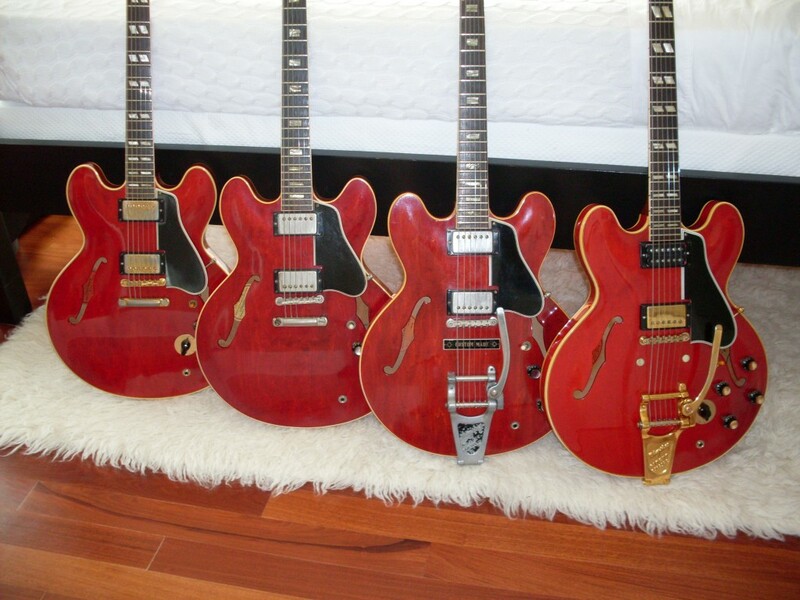 Who doesn't love a red 335/345/355? I would have kept all of them if I could have. Left to right: '60, 64, 63, 60. 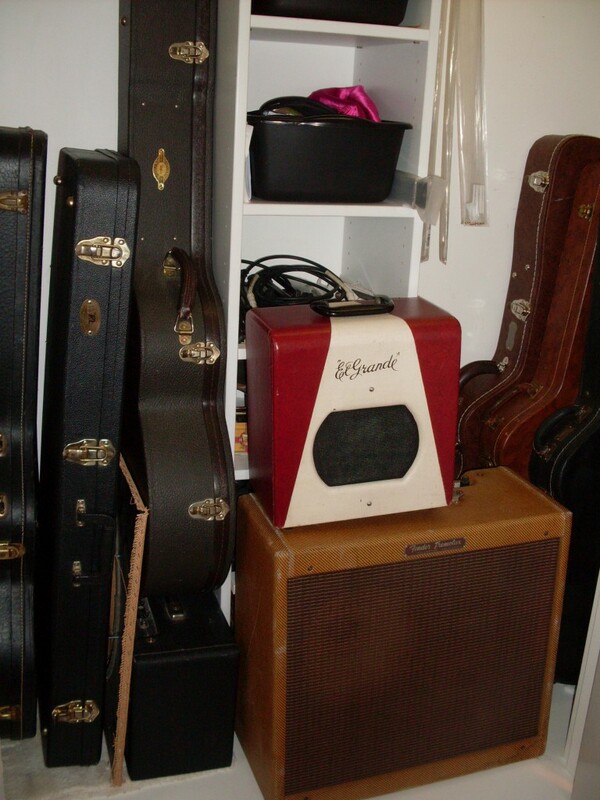 The guitar closet at my house. This is pretty much the whole collection. You can see a few 335s and 345s in their cases (black and brown), the Taylor 12 string, Robin Ranger in the square case and my tweed Tremolux (with a custom 2-10" baffle)and "El Grande"-a 54 Supro Spectator and a BF Fender reverb unit underneath everything else. The modern case in the back corner is what I use as a shipper if a guitar needs work..
You might figure that since I buy up most of the good (and well priced) 58-64 ES-335s, 345s and 355s out there, that I’ve played them all and my collection is complete and I’m happy to let all these wonderful guitars slip though my hands. Au contraire. That’s French for nope. If I kept every guitar I fell in love with, I’d probably have 20 or 25 guitars. I have only 5 “keepers”. 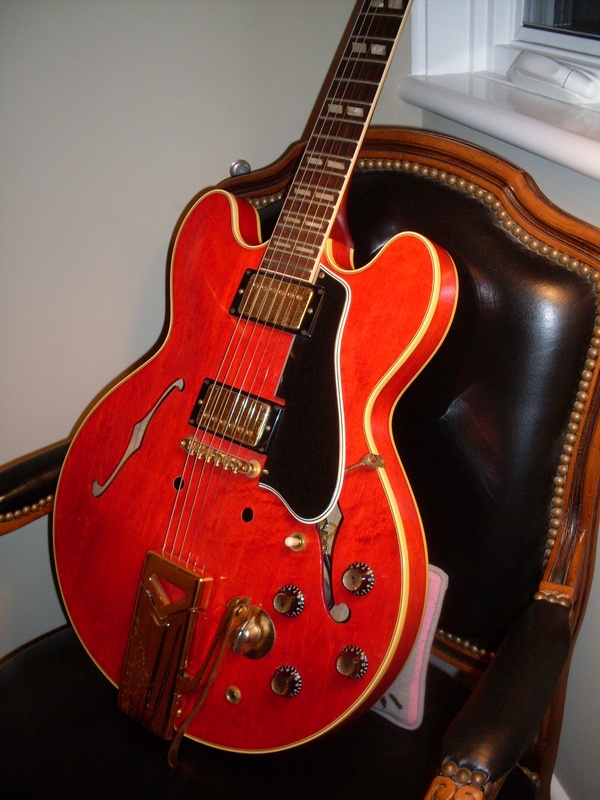 I have a 64 ES-335 in red. I have a 53 J200. I have a 2003 Taylor 655 12 string. I have a 1998 Robin Ranger that was my son’s first decent electric and I have a rotating stock of ES-345s. More about that later. But, like most players, I have a wish list. Really. You would think I would have found everything I want by now but I haven’t-or I have and I, stupidly, sold it. I’ve been searching for the most elusive one- a red 59 dot neck- for years and I’ve found a couple but they keep slipping through my fingers. There was one in Nashville not too long ago that was at Joe Glaser’s shop and my Nashville bud Kent tipped me off to it. By the time I got to it, it had (apparently) gone to Vince Gill. There was another in California that another guitar buddy had heard about and I missed that one too. I’ve also been looking for a blonde dot neck and they keep eluding me as well. I’m not about to spend $50K plus on a 335, so the likelihood of finding one I like is slim. I think the “blonde premium” is far too much (that goes for guitars and women) so until I find one (the guitar, not the woman-I’ve already got a blonde one) for $30K or less, I’m going to do without. The 345s, however, are another thing altogether. I’ve owned more 59-60 345s than any other model and year. I just love these guitars-especially the late 59 early 60’s with their very 64 like neck profile. What’s so interesting is that they are all different. There must be 4 or 5 neck sizes and at least 3 different body depths during this period. The reason I haven’t found a keeper is that I keep finding better and better examples. I almost always have one in stock but sometimes a customer asks me to find one and the only one I can find is the one in my closet. This happened recently with an absolutely wonderful sounding 59 sunburst. There’s a mint 60 living in the closet now that I’m quite taken with. Now, I’m partial to the earlier red ones but they don’t come up that often. The red 59 I had with a pair of zebra PAFs had the misfortune of showing up early in my adventure as a dealer. If I got that one today, I never would have sold it. While I appreciated how rare it was, I didn’t appreciate how great it was. It was also the earliest red 345 that has surfaced. It had that perfect fade that the early ones get. I called it “The Watermelon”. The photo will tell you why. So, I’d like to find another one of those. The next thing I want is a stoptail mono 355. These are pretty rare too but I’m going to see one this week in New Jersey. There’s another in Nashville that I know of. I’d really like to find a black mono stoptail 355 but I’m not sure it exists. Gil Southworth will probably write me to tell me he has one (he had the blonde 355SV stoptail in the book “Gibson Electrics: The Classic Years” by A.R. 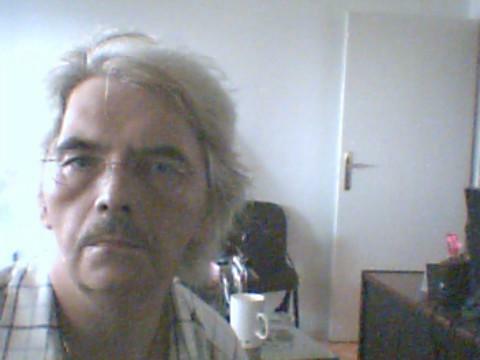 Duchossoir). So, if you’re out there and you enjoy reading my stuff and you have one of these guitars on my wish list, just pack it up and send it to me. I’ll send you a whole pile of money and a hand written thank you note. The elusive red 59 dot. This one comes from Tom Hollyers wonderful site at www.es-335.net and I think I know who owns it. Maybe if I win the lottery, I'll make him an offer he can't refuse. I know of two others but they are both Bigsbys. "The Watermelon" The best 345 I've ever owned and, like a dope, I sold it. It is the earliest known red 345. I love the really little stuff. The details that other 335 aficionados either ignore or don’t know about. 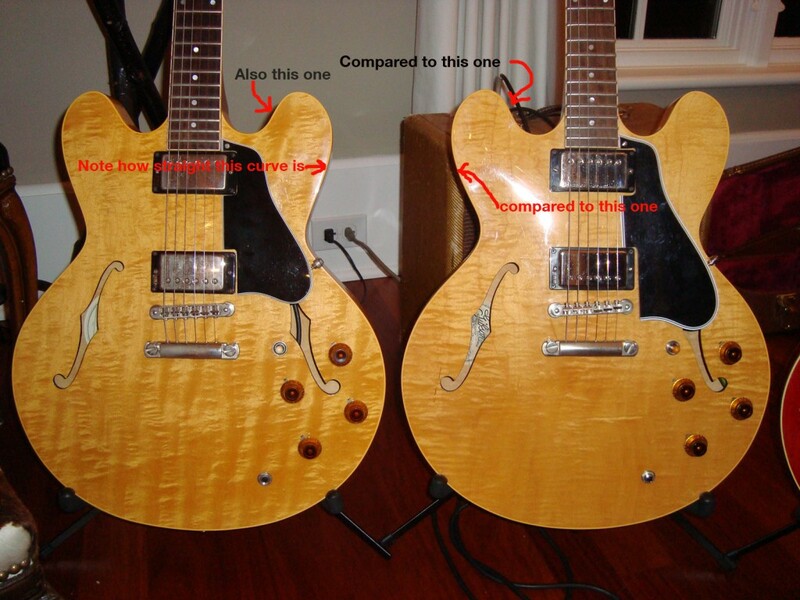 Over the past few years, I’ve seen a couple of ES-345s that had an unusual Varitone switch. The chickenhead knob, which is usually black, is painted gold. When I saw the first one, I figured it wasn’t factory-it was just someones aesthetic choice. Then I saw two or three more and realized that this is, in fact, a factory feature. 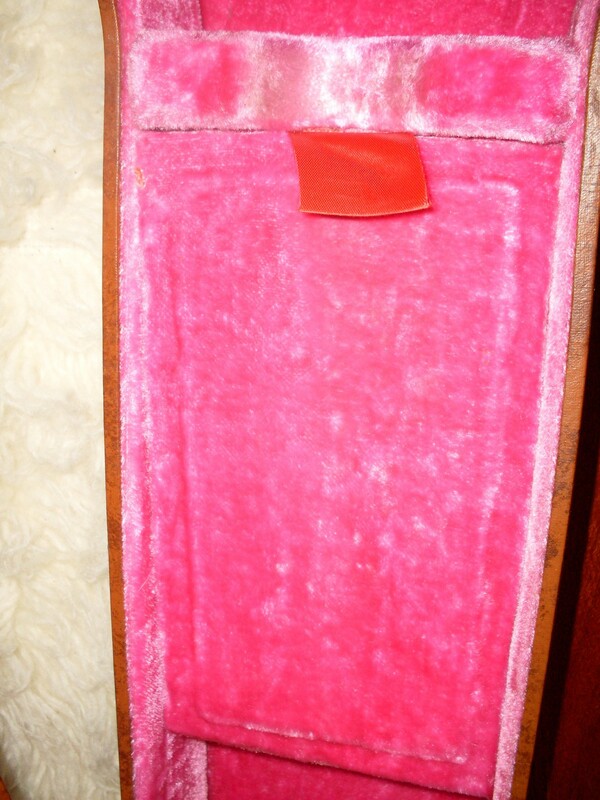 When's the last time you saw the pull ribbon on the case pocket of a 52 year old guitar look like this? The guitar in the photo is one of the last 345s to leave the factory in 1960. It’s only about 100 numbers from the end of the year, so I figure its from the last week or second to last week in December. It has a number of features that are more common in 61-most notably the sideways trem which really only shows up on 345s for 2 years-61 and 62. It also has a white switch tip which is more commonly associated with 61. The long guard says 60 though, loud and clear. But what about the gold chicken head? Gibson was always trying to eliminate steps in the manufacturing process. The thinking was, fewer steps means less production time which means lower costs and higher profits. There were dozens of cost cutting measures put into effect during the era, not all to the good of the instrument. That’s another post. But why add the step of spray painting the knob? Seems kind of dumb, doesn’t it? Granted, it was probably less than an hours work to do a years worth of them but still, the corporate culture was dictating otherwise. One other thing to note. You can see in the photo that the trem arm is in the way of the Varitone switch. Bad design? Well, partially. The ES-355’s that got the sideways often got a round knob rather than the chickenhead but there’s more to it than that. Back in 1960, nobody even made the ultralight gauge strings we’re all used to today. The average set of strings were .12’s and were probably flats. That causes a lot more tension on the trem and would cause the arm to sit closer to the housing, perhaps making enough room for the chicken head to actually turn. Or not. There isn’t much more to say about the switch but there’s plenty to say about the guitar. I’m pretty careful with my guitars but, even so, I still manage to whack the closet door with the guitar every now and then if I leave it open. Or, I smack the headstock into the wall in the laundry room where I do my repairs and setups. It just happens a couple of times a year. So how in the world does a guitar exist for 52 years and stay mint. It boggles my mind. This particular 60 defies logic, it’s so clean. It has one ding on the entire guitar at the very top of the headstock. That’s all. No wear, no checking. A little pitting on the gold on the trem and the shrunken tuner buttons are the only things that tell you this isn’t a reissue. I got it from the second owner who never played it (drummers, go figure). The original owner had it for more than 40 years, so I assume he played it once in a while. The thing that just blows me away is thecondition of the inside of the case. 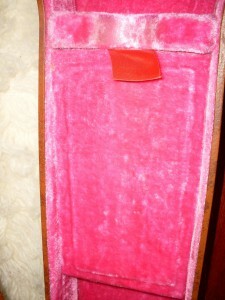 The ribbon on the case pocket always gets trashed first. This one looks brand new-like no one ever opened the pocket. There’s a reason these time capsule examples command a premium. How many are you going to come across? In the past two years since I’ve gotten serious about the vintage thing, I’ve seen 2. Both, coincidentally, red 60 ES-345s. Maybe they’re just too pretty to play or else it has something to do with the gold chicken head. Here it is on my repair guy's bench. What's wrong with this picture? What's wrong is the guitar needs nothing, so why is it even on the bench? 1968. End of the Second Era. 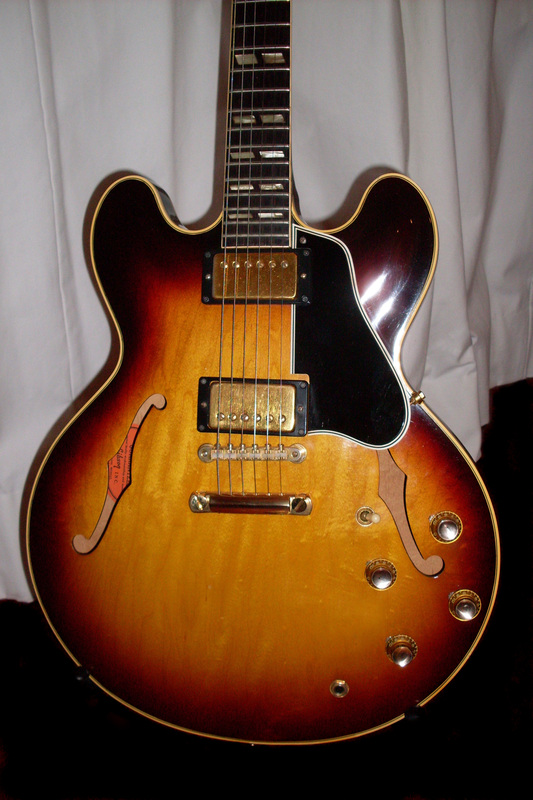 A 68 is a relatively good value and what I consider to be the last of the great 335s. It still has the one piece neck and long tenon (gone by mid 69) and some even have pre T-tops-more than you would think. Big f-holes tell you its a 68 and not a 67. Knobs have been changed to the older type. Witch hats belong on an amp. 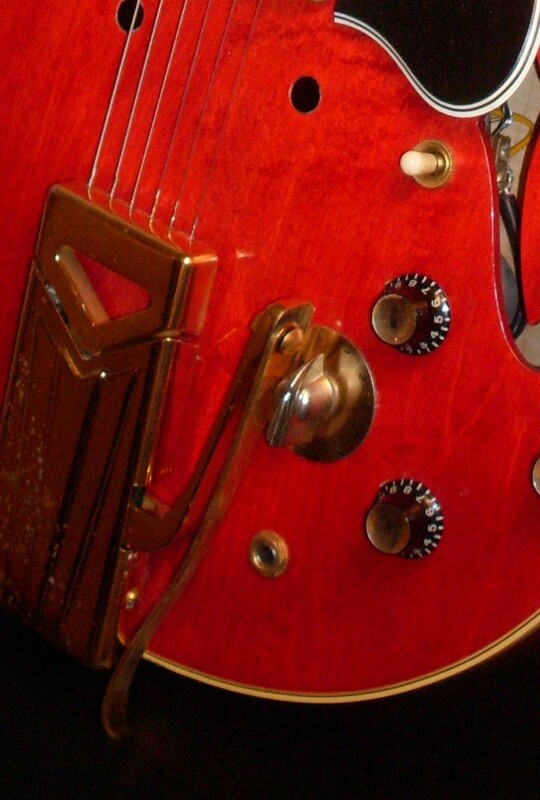 A while back, I wrote about the erroneous common belief that Gibson returned to the wide nut in 1968. They didn’t but the neck got a good bit larger everywhere else-at least when you compare it to mid 65 through 67. I’m currently in possession of a somewhat compromised 68 but, now that I’ve spent a little time with it, it has some surprising good points. 68 is a tricky year because there were a number of changes that are confusing. You start seeing a pantograph type logo but you also still see the conventional logo and you even begin to lose the dot on the “i” in the conventional logo. Gibson also enlarged the f-holes If you’re trying to identify your guitar and the serial number is ambiguous (used up to 4 times), then the f-holes are your best guide. As far as aI can tell. the larger f-holes started showing up almost from the start in 68. The changes of 67 are all still evident-narrow bevel guard, witch hat knobs, lower flowerpot inlay on the headstock but the big f-holes will give away a 68 every time. It’s not so easy to tell if you only have a 68 in front of you but if you have anything earlier to compare it to, it’s pretty obvious. I’m not sure why the made this particular change since they stopped stuffing the harness in through the f-holes in the early 60’s when they cut a chunk out of the center block to make harness installation easier and faster. 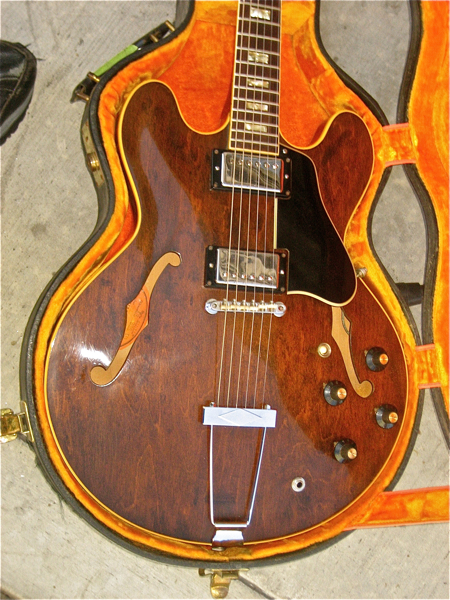 1968 is also the year Gibson had the bright idea to offer a Gretsch Country Gent-like walnut finish. Gretsch was selling a lot of them thanks to George and Gibson, I guess, thought they could grab a share of the market by making a 335 in the same color. Although the shipping charts show the walnut starting in ’70, they really started in 68. Of course, Brazilian rosewood had disappeared during the mid 60’s as well and while you might find it on a 66, you aren’t likely to find it any later. My 68 has Indian. My 68 also appears to have pre T-tops. They have the Philips screws on the back which isn’t conclusive, but since the pickups are still sealed, I have no plans to open them up. I haven’t owned very many 68’s-this is only my third-but the other two had pre T-tops even though they are not as common as T-tops by this time. The guitar is nicely constructed and finished well even though Gibson had been struggling to keep up with demand and was just catching its breath by the time the market started its decline after peaking in 67. ES-335/345/355 production dropped from over 7250 in 67 to around 5000 in 68. That’s a 30% drop which is huge. Remember that’s the era that almost saw Fender discontinue the Stratocaster because sales dropped so precipitously from 66-68. Still 5000 ES 335/345/355’s is a lot of guitars especially when compared to as recently as 64 when they only made about 2000. Quality had suffered a bit due to the boom but not that much-certainly not compared to what would happen the following year when they sold the company to Norlin. I consider the 68’s to be the last of the really good 335s, although it slopped over into early 69. The end of the long neck tenon, the three piece neck and the volute all made 69 a less than “golden” year. But 68 is still pretty darn good if you can handle the narrow nut-which, to be sure, is made more palatable by the bigger neck profile. 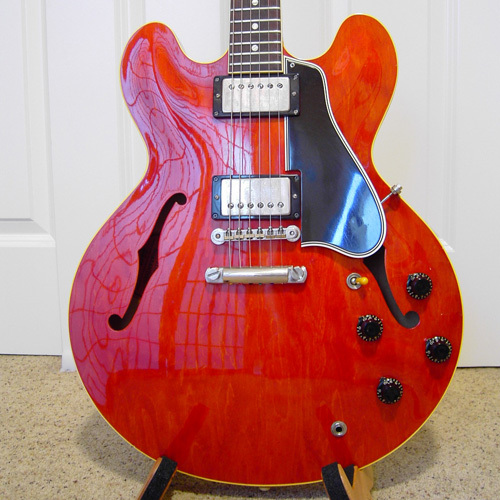 Now, the one I just got has a headstock crack, so it falls outside of the price range of most 68s but you can figure that $4000-$5000 for a 335 and maybe $500-$1000 less for a 345 or 355. 1968 is also the year the less than desirable walnut version showed up. I am not a big fan of these. Well, I had to proclaim that there are no mono non Varitone 345s only to have one sent to me today. Just when you think you know everything, something comes along to remind you that you don’t. I mentioned in a recent post about how if there was a mono, non Varitone 345, that it would be very popular but, alas, while there are some 335s with the 345 inlays, there are no non Varitone, mono 345s. 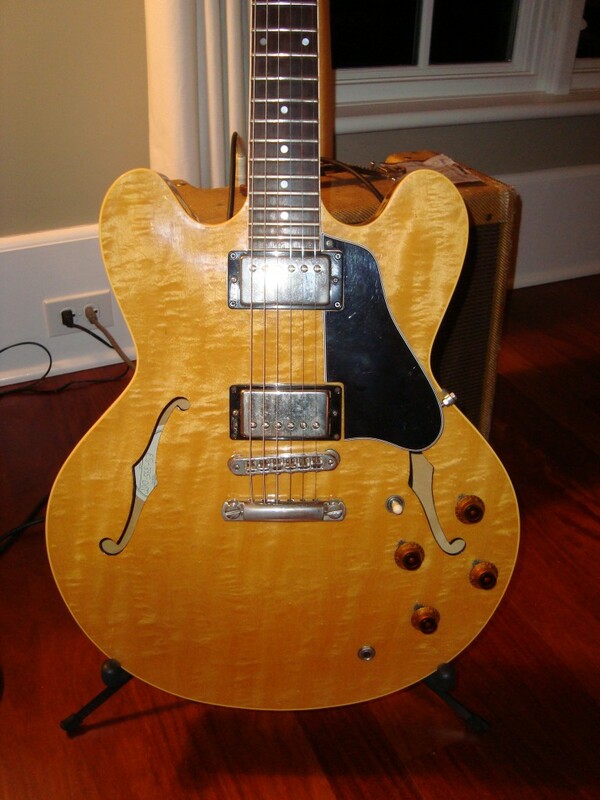 What exactly would that be-if not a gold hardware 335 with parallelogram inlays? Don’t forget that the binding on a 345 is different as well-the 335 has single ply and the 345 has 3 ply white black white. 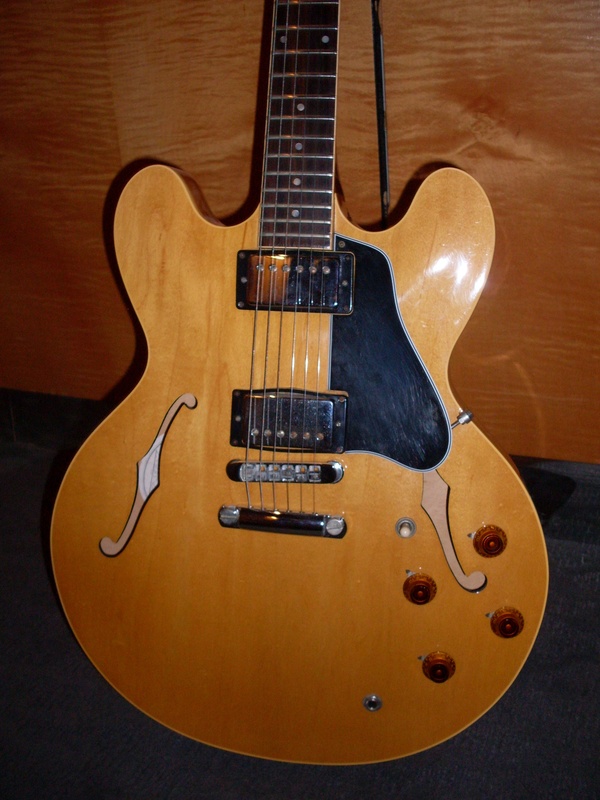 Had the ES-345 been available as a mono, non Varitone model, it wouldn’t have been very different from a 335. Really, just the top binding, the gold hardware and the inlays. I have found that the quality of the wood seems a bit better in 345s than in 335s-more figuring, usually but most of us don’t like too much figuring in our ES models anyway. I’ve seen some stunning flame-usually on the backs of 335s and, more often, on the front of 345s but usually it is pretty subtle-maybe a little flame or some birdseye. Nice. Subtle. So, in keeping with the idea of a line of guitars with three models, it just wouldn’t have made sense to offer a mono 345. 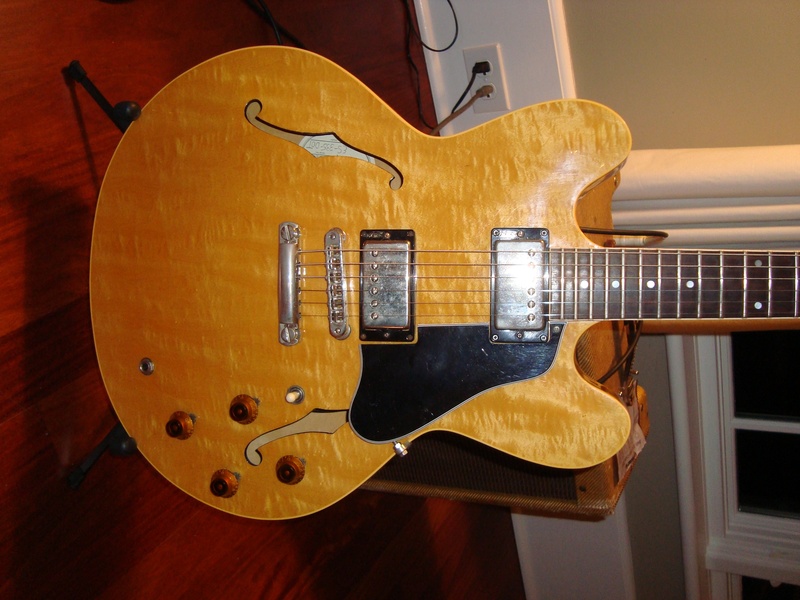 Perhaps gold hardware as an option on the 335 would have been just as nonsensical. The 355 is perhaps a different story since it was so much fancier with it’s heavily inlaid headstock and 7 ply top binding. It was clear that these “tuxedo” elements were meant to appeal to the showman (or woman) and I’m not surprised that they only offered red as the standard color, although black would have been very classy. I guess they didn’t want to cut into the sales of the Les Paul Custom. I’m told that Gibson used to bend over backward for artists and would make just about anything a well known player would want. That brings me back to the guitar in the picture. 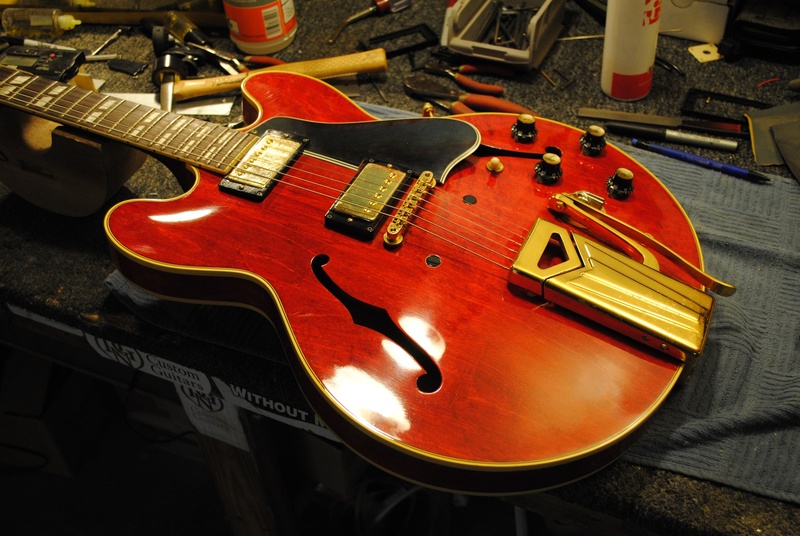 Well, it’s got a 345 fingerboard and gold hardware but anybody could do that to a 335. But wait, look at the binding. that’s 3 plies, folks. Here I go, shooting my fool mouth off about there being no mono 345s and, bingo, somebody can’t wait to prove me wrong. Looks to me like a 61 or 62. Nice shape too. UPDATE: April 2, 2012. April Fool. It’s a Photoshopped ’61.